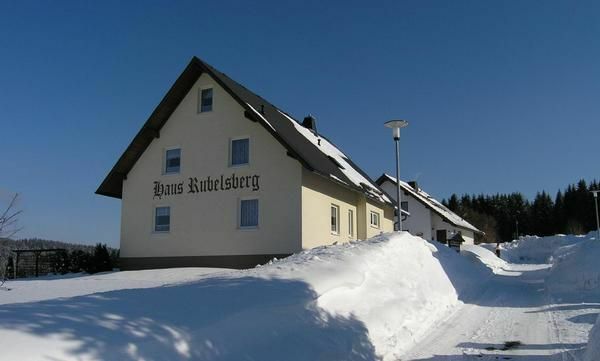 The 'Gästehaus am Berg rubles' has 6 separate units, a breakfast room and a spa with sauna and jacuzzi. It is idyllically situated amidst the 'biosphere reserve Vessertal', at the edge of the village Vesser. From our terrace with garden furniture and barbecue you have an unobstructed view of blooming meadows and the adjacent mixed forest. Hiking trails, ski lifts, ski trails and sledding hill are max. 300m from the house. The individually decorated accommodation units are well equipped for self catering, but also for guests who want to indulge in our breakfast buffet. The apartment has a spacious bathroom with window, sink, shower and toilet, 1 bedroom, living room with comfortable seating, satellite TV and W-LAN, and a well-equipped kitchenette. Please note that only small dogs (up to 30 cm) are allowed. Breakfast: per person and day costs of 7. 5 EUR (optional). Vesser, a small, idyllic place located in the middle of Vessertales, which was voted "Most Beautiful Valley Central Germany" of 2007. The location is ideal for those seeking tranquility, hikers and skiers, but at the same time many famous attractions and central and easily accessible, so can be reached in a short time. Breakfast (per person per day, perform 6 EUR by the tenant).